Stunning custom California built bungalow with a unique loft is a rare find! 9’ ceilings, 8’ doors, & hardwood flooring welcome you in to this must see home. Chef’s dream kitchen comes complete with professional grade appliances (Wolf, Sub Zero, & Miele), granite counters, custom cupboard pullouts, & corner pantry. Main floor office with built ins & the living room share a two sided fireplace, while the dining room & kitchen share the second fireplace. Master retreat has a spa like en suite with a 10mm glass surround shower, soaker tub, dual sinks, heated floors, & WIC with built ins. Laundry room, locker style mud room, & front patio with gas line complete the main floor. The loft is home to an abundance of natural sunlight, the second bedroom, 4 pc bath, & large living room. Professionally finished basement offers a wine cellar, wet bar, 2 large bedrooms (both with WIC), 4 pc bathroom with heated flooring, family room, games room, & an enclosed theatre room with tiered seating & projector. Additional upgrades to the home include a triple tandem garage, irrigation, & A/C. A skillfully landscaped back yard features a large deck, mature trees/shrubs, & a black iron gate/fencing. 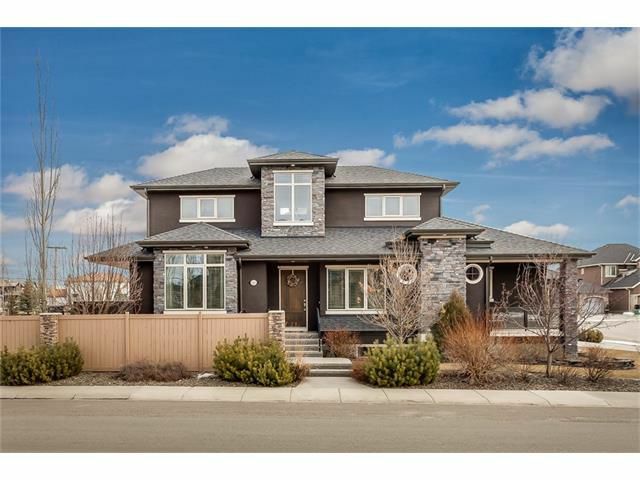 Conveniently situated on a corner lot, backing onto a walking path that leads to Fish Creek Park.